All beings have an energy field around them, often known as the aura that looks like a luminous ball of light. Aura works like a battery; it keeps our body healthy and alive. Once the aura is balanced and bright, our wellbeing is guaranteed. Pranic Healing provides the science behind living healthily, supported by tons and tons of researches and testimonials all around the world. The different methods of cleaning and energizing the aura and chakras are all parts of Basic Pranic Healing workshop. Basic Pranic Healing is designed for everyone, from students to engineers, doctors to housewives, parents to teachers as it introduces methods of healthy living. People from all walks of life worldwide have learnt and benefited from Pranic Healing. You can be one of them! 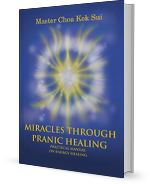 First published in 1988 under the title The Art and Science of Pranic Healing, this book introduces the reader to the concepts of Pranic Healing, how it started, and how it has been developed and systematized by Master Choa Kok Sui.